For those of you who follow us on Facebook and Twitter, you’ll know just how busy these last few months have been for Barefoot Clinics. We’ve achieved so much and we want to share with our success with all of you. So we’ve made a short video that covers some of our recent highlights. Please click HERE to watch the film. We hope you enjoy it. 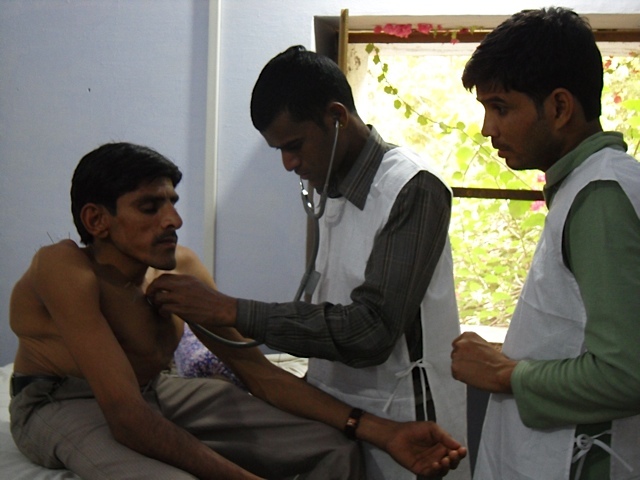 Your donations are vital to Barefoot Clinics, the students they teach and patients they serve. Please donate whatever you can via our website www.barefootclinics.org.uk. To stay up to date with Barefoot Clinics, follow us on Twitter or find us on Facebook. We’ll also be sending you a monthly newsletter by email. The Journal of Chinese Medicine, founded by Peter Deadman, has invited us to write a regular blog on their website. Each month, we update readers with our work and outline some of the remarkable results we’ve achieved with patients. 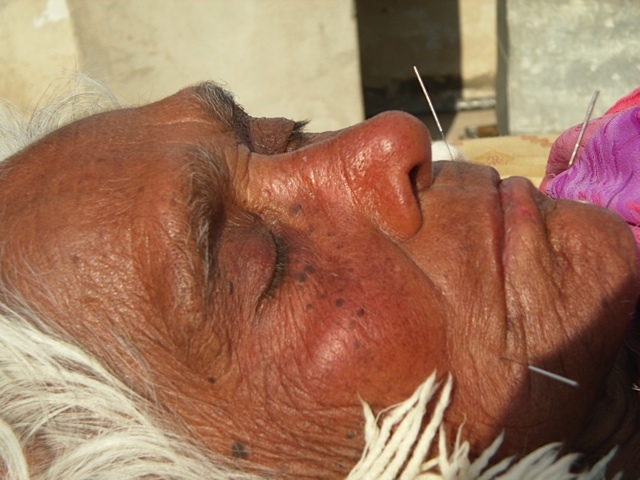 Our latest installment on ‘Acupuncture in Paralysis’ can be found at the blog’s home page: http://www.jcm.co.uk/barefoot-clinics-blog/. 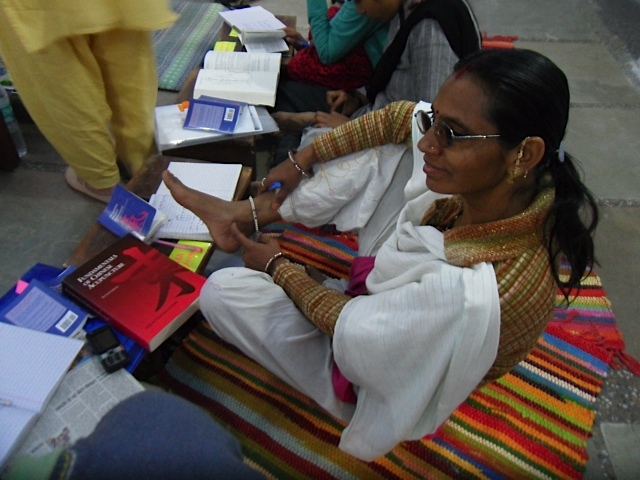 Sarju Devi continued to make progress and following the start of some lovely scalp acupuncture she rallied a huge amount of energy and stood up! She supported herself well on both legs, although she needed support, and the reflex action to walk was there – she tried to take a few steps but is still a bit weak for that. She was watched by her eldest son (75years old) and her great-grandson, who appropriately clapped his hands in glee to see Great-Grandmother on her feet again. But there were still complications to contend with. Sarju Devi gave us a fright when she went downhill for a couple of days, looking very ill, feverish and not registering anything at all. We tracked the cause down to a nasty bed-sore. The family leapt into action and put it to rights and cleaned out the wound so well that the infection and fever cleared. After the next treatment she stood up and managed to shuffle her feet forward to the chair, turn around and sit down. Her youngest son congratulates her and she looks rightly pleased with herself. She smiles widely! She smiles a lot now apparently – especially to see her grandchildren and she knows their names and recognises everyone now. We are so happy with her continued good progress. This case is also an important experience for the students, who witness the treatment methods and how to manage a case like this on their own, for when they graduate and return to their villages. We will keep you updated on Sarju’s story. Meanwhile, the students are needling up their own patients with proficiency and witnessing the remarkable health benefits of acupuncture for themselves. Happiness all round. Acupuncture proves its point ! We hope that 2012 is beginning well for you all. For Barefoot Clinics, the year has already been busy and full of success. Click here to see a short video of the students taking their exams. They all performed brilliantly. This week, Leilani and her students responded to a patient in desperate need of treatment in a village near Tilonia. Here, Leilani reports on the patient’s remarkable progress. 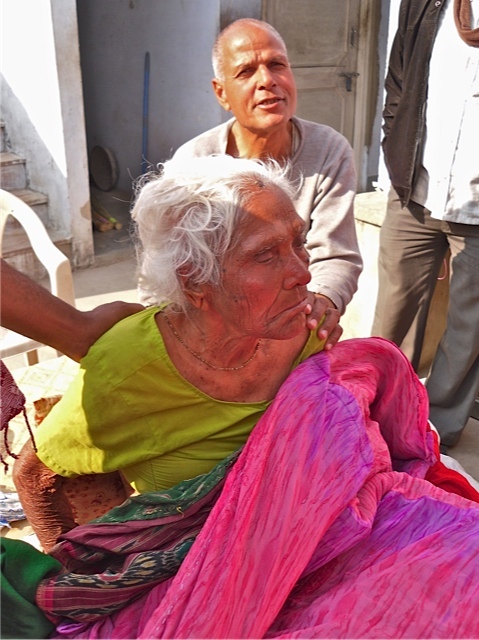 Sarju Devi is 95 years old from a nearby village. Last week she had a stroke and was paralysed down her entire right side including loss of speech. 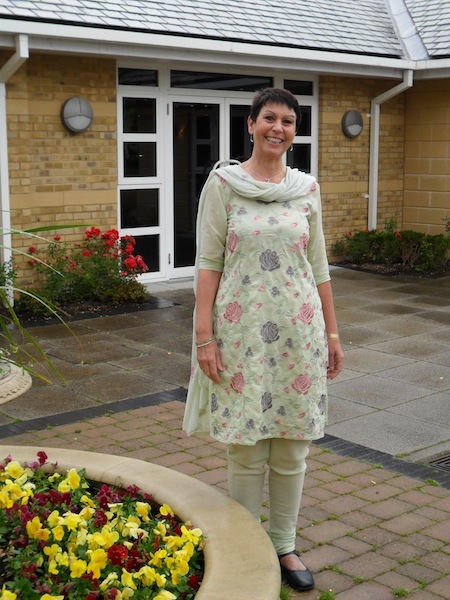 When Sarju had a CT scan, it revealed an acute haemorrhage. 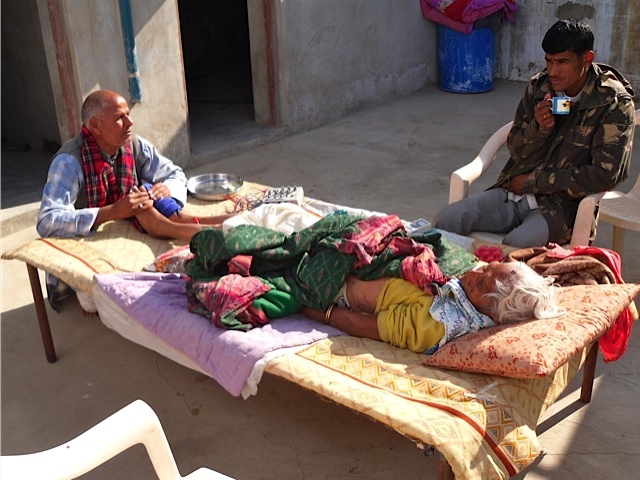 We went to her home and started her treatment – her family were around her: her oldest son, 75yrs old, watched as she was needled up on a cot in the sun; there is a dignity to her being treated in her own home. I take 2 or 3 students with me on each visit so that they all become familiar with the case and the treatment; they are doing an excellent job. Sarju’s right arm and leg were stiff; it was very difficult to move. Her right leg, from just above the knee all the way to the toes, was ice-cold. She was weak and very sleepy and barely wanted to open her eyes. She was completely unresponsive to stimuli and to her family around her. She has a catheter in place. Her family were spoon-feeding her liquid foods, her appetite was poor. After her first treatment, her wrist became completely flexible and she gained some movement in her limbs. Her mouth relaxed and her face lost the tension and muscle spasm. Today, after 6 treatments, she is able to sit up with help, she meets one’s eye knowingly and is responsive. She is trying to speak again. A whisper of a smile can be seen around her relaxed mouth. She can use her right arm, which was previously paralysed and circulation has returned to her right leg, making it warm as the rest of her body. Her appetite has improved and she is eating well. Her catheter had been removed and she has had an enema. I’ve shown her family some basic stroke-recovery exercises and later this week we will get her to sit up for some hours. As soon as she is able, we’ll see if she can manage to stand and take a few aided steps, well supported. We continue to see her every other day and will keep you posted. 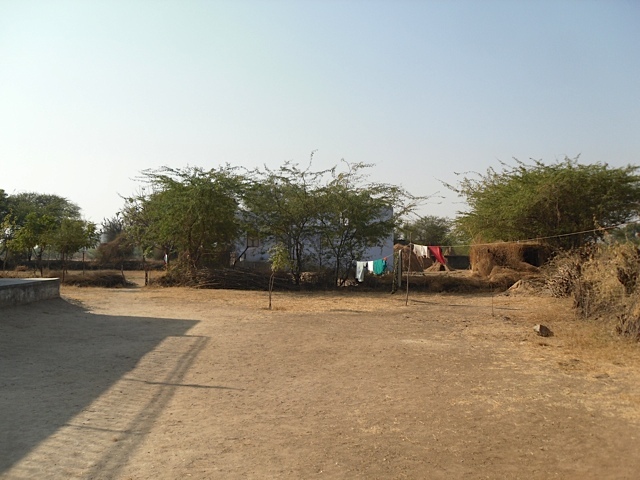 This is just one example of the work that Barefoot Clinics is achieving. When the students graduate, they will be able to meet the challenges of helping post-stroke cases quickly and effectively, back in their own villages. 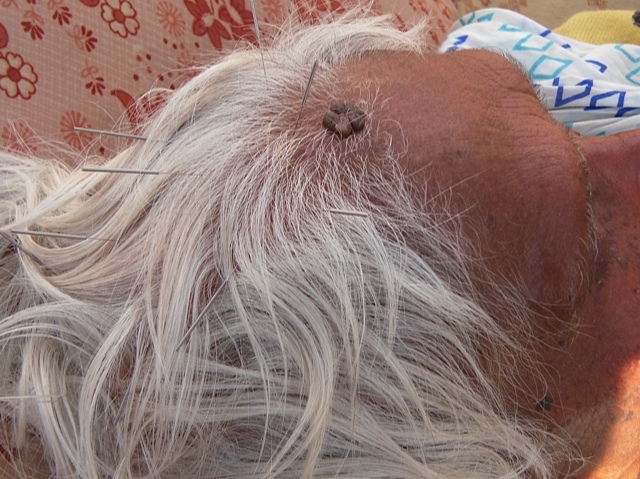 Acupuncture is again proving to be effective, portable and inexpensive; a perfect health solution for India. The students are doing a great job; they are sincere, enthusiastic and hard-working. Dr Battacharya sits next to me and translates into Hindi for the class, adding his own unique sense of humor and of course his medical insights, to the procedures. We all enjoy our classes together and apart from much work there is also much laughter and warmth between us all. They have been practicing needle technique from day one – they really enjoy it! We practice acupoint location daily – it is vital that they get to know all the points really well and I always emphasis the need for 100% accuracy in location. Last week we had a point location test – they had to mark up 25 acupoints in absolute silence, without any book reference. They were more than 90% accurate, an excellent result. We are currently learning to locate all the points on the back – the trickiest of them all – they are doing a great job. Please think of the students and the wonderful work they will be doing now and in the future – do you or anyone you know suffer from high blood pressure? Or asthma? 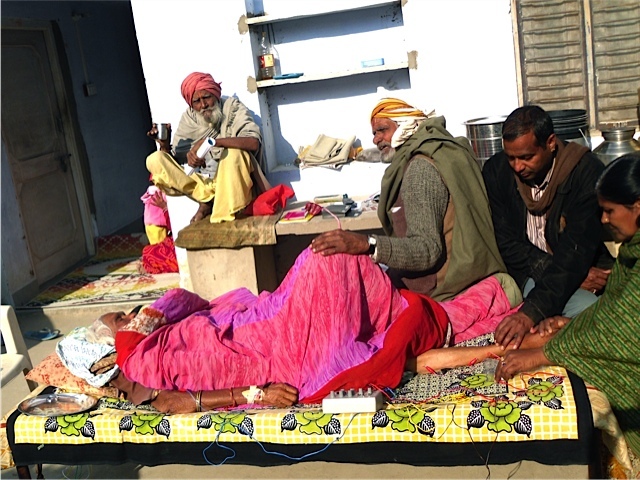 If so, please consider how many patients one of these students can relieve of these worrying conditions, out here in rural India…. Please consider that giving only £50 will buy a student a stethoscope AND a blood pressure cuff for Christmas – its a bargain when you think how much toys cost. If you would like to help more, a mere £10 will buy a simple pen-torch for examining throats and ears. We’ll send you a beautiful gift e-card when you make a donation to barefoot clinics that you can fill out for the lucky gift recipient. Just email anna@barefootclinics.org.uk with your name, the recipient’s email address and your donation amount. Just like a gift receipt, we’ll tell the gift recipient what you’ve bought, not how much you’ve spent. You can give a single donation via Paypal – just click on the ‘donate’ button that’s on every page of our website www.barefootclinics.org.uk. Monthly donations help us to plan our work more effectively and ensures that we can continue to supply and develop the clinics we’ve established. barefoot clinics is bold, beautiful and brightening the lives of hundreds of patients. That’s all thanks to the generosity and goodwill of you, our supporters. Now you can give a gift that lasts this Christmas. All our thanks for your continuing support and the wonderful things you’re helping us to achieve. 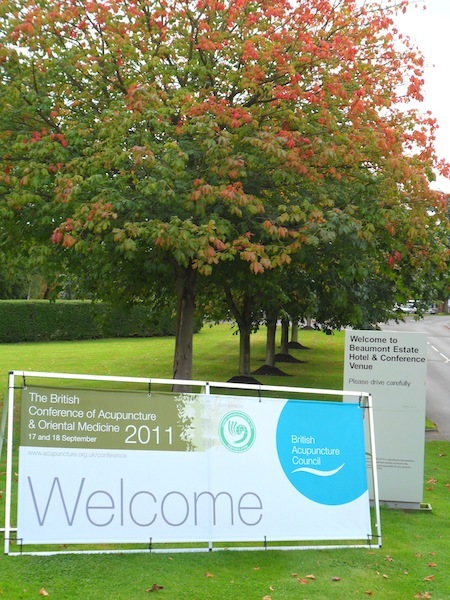 The weekend at the British Acupuncture Council’s Conference on Acupun cture and Chinese Medicine was wonderful, what an event – it was all so thoroughly well planned and hosted an incredible range of events by professionals from across the UK & internationally. 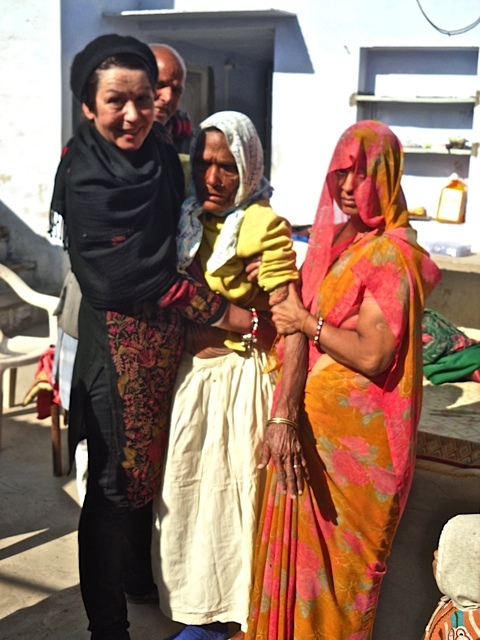 I enjoyed being able to speak about the barefoot clinics project including showing some lovely footage of the Acupuncture Puppet Show put on by the puppet masters at Barefoot College in Rajasthan – an ingenious way of explaining acupuncture and our new clinic facilities to the impoverished and illiterate in all the surrounding villages. In addition we screened extracts from ‘Portraits of Change’, a film which showcases the marvellous work of Barefoot College, and gained a lot of interest. We have many lovely volunteers lining up. I also created a short video of the monks and nuns as students – what caring and wonderful people they are. I am so proud of the fine practitioners they have become and will visit Kathmandu in April of next year to help them in their clinics and to give them a Refresher and a Master course. The two short films of the puppet show and the students will shortly be uploaded onto YouTube and available to watch via our website. 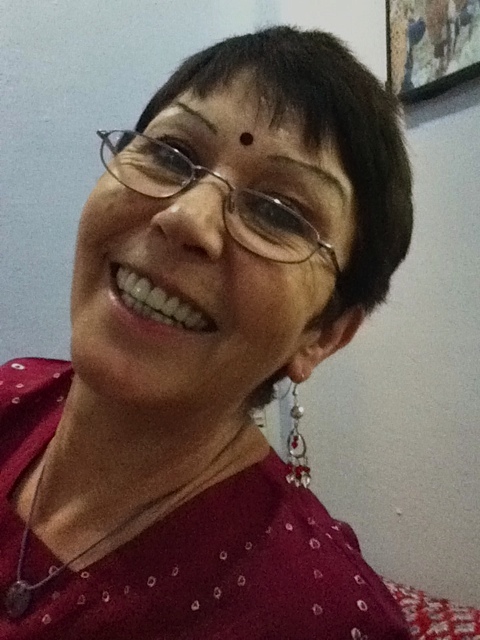 A really super idea came from Annie Milles at Manchester Metropolitan University, Senior Lecturer of their new Acupuncture and Chinese Medicine course, who suggested linking their students and ours at Barefoot College. We hope this will give fresh insight on acupuncture to all students involved. Last but not least, I received a very generous and wonderful donation from Peter Deadman: an iPod Touch with his new Manual of Acupuncture app wh ich is shortly to be released. I had a preview of the app at the conference and fell in love with it immediately – what a teaching aid! It’s a simple and brilliant way to help the students here learn. It shows the point locations so clearly and also contains short video tutorials on how to needle each point; an invaluable tool, especially for illiterate students. Thank you to everyone at the conference for your interest, support and generosity. We’re now official and online ! We have been busy working on the charity all summer, with great results. We are now officially recognised by The Charity Commission as a registered charity. This is thanks to you, our supporters, who have helped us achieve so much in the last year. So, thank you and please continue to support us in whatever way you can. We’re growing into something really remarkable, and this is just the start. For an in-depth look at the charity and all that we do, including photos and videos, visit our new website www.barefootclinics.org.uk and please share the link with family and friends. We’re now seeking support for our next project. 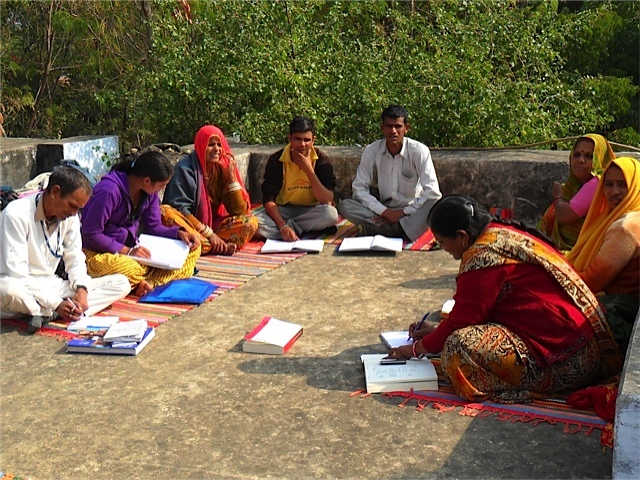 In September, Leilani will return to India to teach a new class of students in Rajasthan. These local people will go on to run their own clinics and bring the benefits of acupuncture to hundreds of people who would otherwise have no healthcare whatsoever. barefoot clinics needs your help to make this happen. Just £5 buys vital hygienic and medical supplies for a day’s clinic. For every £100 we raise, we can provide one month’s training for a student, including study materials. You can make a real difference by donating at our website: www.barefootclinics.org.uk/donate. LIKE us on Facebook: www.facebook.com/pages/Barefoot-Clinics/150398081703489 and share the link with family and friends. FOLLOW us on Twitter: http://twitter.com/barefootclinics to keep up to date with all our latest activities. 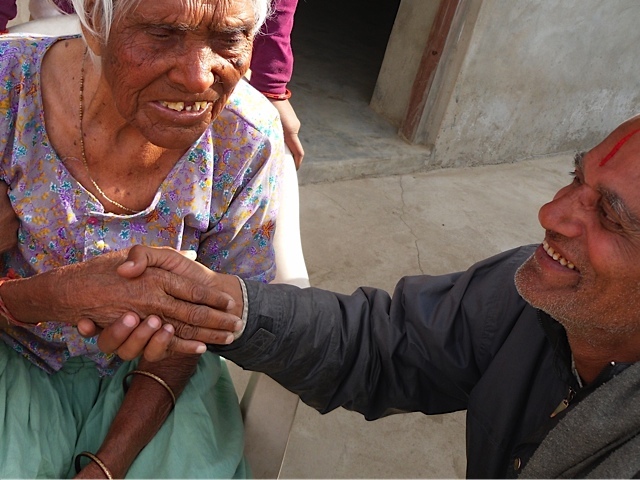 As you know, we are 100% reliant on donations to carry on with our vital work in India and Nepal. If you are in a position to help, your donations will be very gratefully received. Please visit our website to donate monthly or give a single donation: www.barefootclinics.org.uk/donate. P.S. 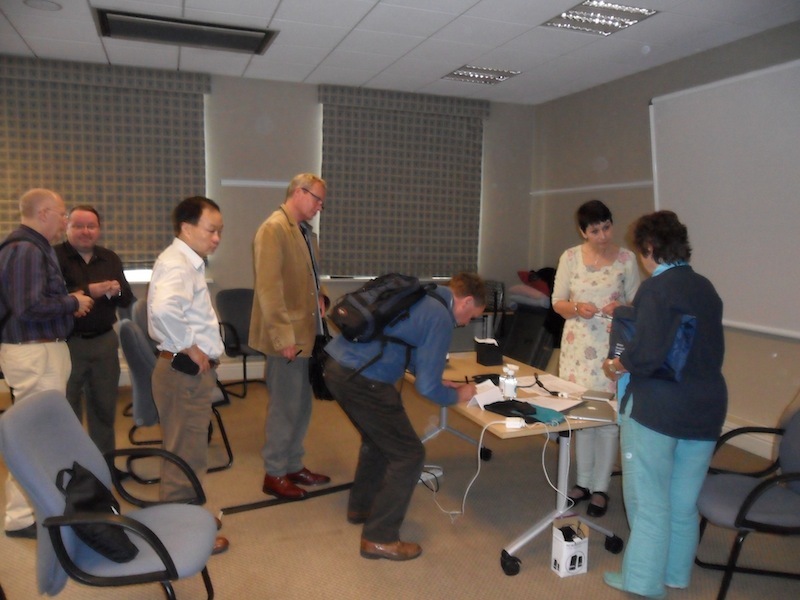 Leilani Lea, director and founder of barefoot clinics will be giving a presentation on the project at the British Conference of Acupuncture and Oriental Medicine organised by the British Acupuncture Council on 17 & 18 September 2011.
barefootclinics on We need your support !